This was an interesting project for the month. In comes a set-neck style guitar, the problem being a truss rod doing a bit of rattling. The guitar still played well, but the truss rod was at an almost relaxed position, with just enough room for minor adjustments but not enough to get a few good turns on the rod and quiet down the rattle. So the task was figuring out how to fix the problem without an exhaustive amount of labor. The worst case scenario was basically a new neck, which would have been a huge undertaking – neck removal, making the replacement, fitting it to the guitar, repainting the instrument, as so on. We’re talking many hours and a massive repair bill, so we opted for a simplistic approach. 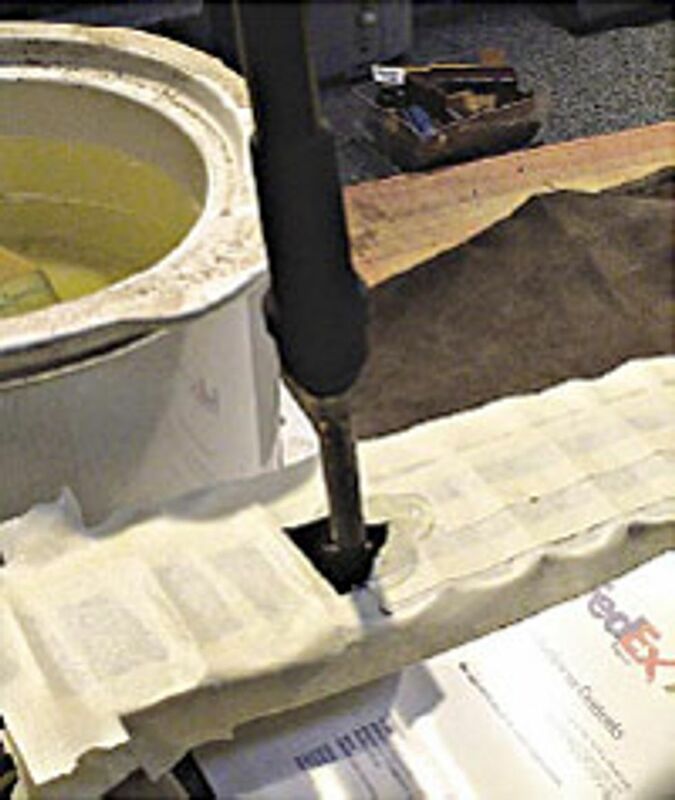 I had run into this type of problem once before and in the process, devised a cool little trick that is friendly to the guitar, repairperson and the customer’s wallet – all with excellent results and no damage to the integrity of the instrument or its value. In this case, the guitar featured a standard Gibson-like truss rod. 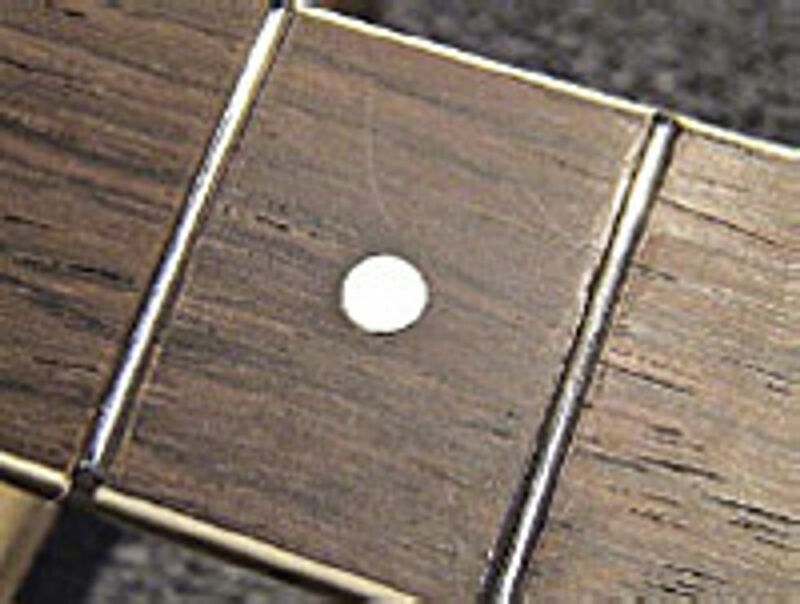 We noticed that a few turns on the truss rod made the noise completely disappear before the repair, but made the neck back bow to the point of being unplayable. As a result, we knew we didn’t need much to make it right. Keeping with the GK metal cabinet theme, I planned to dig up some light gauge steel and have it bent to create the bottom and two sides. Being a budget project, I was calling in favors and willing to use remnant materials to build it. My buddy Scott scavenged up some ¼” aluminum diamond plate, so bending it became out of the question, but the cool factor skyrocketed, so we cut three pieces for the bottom and two sides. The front and rear baffles were made from MDF with pine braces which connected the front and rear. We taped off the fretboard to keep any mess from getting on the guitar, then fired up the paraffin wax crock pot and popped out a ¼” pearl face dot by drilling it out with a 7/32” bit. The dot basically disintegrates and a little acetone can help soften any remaining glue. A light whisk, if needed, around the edge of the hole with a small Exacto blade to remove any final debris and we’re good to roll. Once the dot was out, we drilled down through the fretboard until we entered the truss rod slot – using a 7/32” drill, this worked nicely to keep our soldering iron from resting on the edge of the ¼” dot hole and distorting our hole size. With the Exacto, we again cleaned up any fuzzy wood debris, so we could see the truss rod inside the just drilled hole. After all that drilling, it was time to fire up the soldering iron. You will want to stick that iron down into the hole, resting it at the bottom, on top of the truss rod and just wait awhile. You’ll feel the fretboard and the rear of the neck warm up noticeably when ready, which takes around 7 to 15 minutes. The idea is to heat up the truss rod so we can pour wax into the hole. The preheated truss rod will naturally draw the wax in, basically wicking itself into the slot and filling any voids to eliminate the rattle. When ready, just pour a small bit of wax into the hole; you can watch it sieve into the slot quickly. You can always stick the iron back in and reheat, adding wax until you think it’s gone as far as it can. Depending on how bad the rattle is, you may have to perform this on one or more face dots until you get rid of it all. We noticed immediately – before strings even got back on the instrument – that the rattle had disappeared without any pressure on the truss rod. The repair was completely invisible once we stuck a new face dot back into the fretboard, sanded and polished it back out. The end result was beautiful and only about 30 minutes of work. Another job well done! I hope this simple repair saves you and your customer some grief some day down the road. Fine Tuned Instruments LLC, home of his “b3” instruments.